Notes: Based on the light novel series by Sadanatsu Anda. Though numbered as episodes 14-17, we follow MyAnimeList in treating Kokoro Connect: Michi Random as a separate four-episode series with its own review. 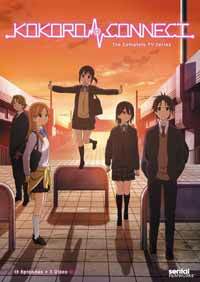 The story involves five high school students, Taichi, Iori, Himeko, Yoshifumi and Yui, who are all members of the Cultural Research Club. One day, they begin experiencing a phenomenon in which they randomly swap bodies amongst themselves. As these five friends face many different unusual phenomena at the whims of a mysterious being known as Heartseed, their friendship is put to the ultimate test. Kokoro Connect is sort of an odd duck - it's often defined as a school comedy but there are aspects of it that are deeply psychological and borderline creepy, and has a thoroughly unlikable alien catalyst (Heartseed) that nevertheless instigates interesting and entertaining antics amongst the members of the Cultural Research Club. It's a premise I wasn't sure was going to work - and instead turned out to be something I looked forward to every week. The primary reason for this is the impressive character work. I enjoyed watching the Cultural Research Club interact and banter and be high schoolers - there's a candor here that is at times surprising, given the often formulaic nature of anime character archetypes and storylines. Taichi Yaegashi (Takahiro Mizushima, among other things Romeo from 2007's Romeo x Juliet) takes what is normally a cookie-cutter male lead role and really stretches it to something a bit special. Both Himeko Inaba (veteran Miyuki Sawashiro, now the go-to girl for Fujiko Mine in recent incarnations of Lupin III) and Iori Nagase (Aki Toyosaki - Yui Hirasawa from K-On!) are characters of unusual emotional range given what we are led to expect from the genre. While Yoshifumi Aoki (erstwhile prankster and minor character actor Takuma Terashima) and Yui Kiriyama (Hisako Kanemoto, better known as the eponymous Squid Girl) are likable, they are clearly the "beta couple" in this party of five, but that's okay. Conversely, this show is uniformly at its weakest at any point that Heartseed is onscreen. I understand that Heartseed is the catalyst for all the events that ensue, but that doesn't make any of the scenes feel any less contrived, artificial, or outright cringeworthy. Note that the initial scenario (body-swapping) would seem like a set-up for a full-season show, but that's not the case here, as Heartseed instigates multiple phenomena, varying from age-regression to psychic emotional transfer, all at random, all designed to break these characters out of their shells for the viewers' amusement. It only gets worse when a second Heartseed comes in to screw with these people some more, and while the results are unexpectedly enjoyable, I truly wish the plot could have occurred in a more organic way. That quibble aside, I was constantly and pleasantly surprised by Kokoro Connect, with even ancillary characters that initially seem like borderline-offensive stereotypes (like the aggressive schoolgirl lesbian class rep Maiko Fujishima) turning out to have interesting insights on the Cultural Club's experiences and friendships, which are realistically fluid and constantly evolving - an aspect of real-life relationships that is well-handled here, more than most school dramas. While the catalyst may feel unnatural, the character reactions are anything but, which is a real credit to both the original creator and the voice acting cast. While this is not a show whose events are ever intended to push aural or visual envelopes, Kokoro Connect is well-designed and well-animated, and there is never a point where this show looks or sounds anything but pleasant. There is a bit of fan-service here and there but nothing so intrusive that it distracts from the relationship dynamics. It's nice to see a light drama that hits its notes just right - this is competent material, though never quite exemplary thanks to the contrived mechanics behind the "random" phenomena. If you're willing to forgive a bit of artificial supernatural tension caused by what are essentially Invisible Alien Space Bats, the characters of Kokoro Connect are well worth following and enjoying. Recommended Audience: Teens and up, due to some startlingly frank discussions about adult themes including suicide, as well as some violence.